Wedding Ring Workshops offer not only unique wedding ring sets, but afford you the opportunity to design and make rings for each other with your own hands. You choose the metal to use and the design you’d like to craft in a meeting with the jeweler taking most of a day. You may choose any cut on your diamond or other stone at 30% below what many other jewelers quote. Other gemstones are available for the central piece or accent stones in your design. Experienced jewelers guide you to a professional finished product, guaranteed. Your friends will find it difficult to believe that you actually made top quality, uniquely designed rings with your own hands. Photographs will be provided following you through the different stages, especially the final photo when you hold the ring you have made. Their jeweler will work with you, to guide and assist you throughout the manufacture, so you will have an excellent end product. Your rings are guaranteed to be comparable quality to any professionally made item. All the metals used in this process are recycled. 18k white gold is the most popular metal, followed by platinum, and yellow gold. Other metals are also available, including fashionable .950 palladium. Because metals are being reused, the cost for you is decreased. If you have an heirloom ring you would like incorporated into your wedding band, it can be melted and added to the metal of the ring if it is the same you choose for the band. If it is a different type of metal it may be used as a decorative accent. Plain bands are definitely not the only option available. These jewelers have a variety of design ideas provided from which you can choose; or if you have an original design in mind, you can e-mail an illustration to them and they will let you know if it is something they can produce in the Wedding Ring Workshop. Stone-setting is a specialty skill. You can choose any stone size or variety for your ring, and make your band, but the jewelers will mount the gems after your ring’s production. You do need to make an appointment to meet with the artisans who help you through the process. Constantly changing costs of precious metals and gemstones mean that you can’t get an accurate price quote until you have chosen the metal you want to use to make your ring, and the specific stones that you will include. Changes in precious metal costs between the date you get a quote and when you actually make your rings will have no effect on your cost if you place a deposit within 3 days of your price quote. A 20% booking payment holds your appointment date and locks in your price. The rest is due at the end of your appointment when the rings are completed. Included in the cost is the assistance required in designing your rings, a disposable camera documenting your experience, so you will have pictures to become part of your wedding album, both of your rings (up to 20 grams total weight), luncheon, and a split bottle of champagne to celebrate your newly acquired skills at the end of your experience. You will have fashioned unique rings with your own hands for one another to cherish throughout your marriage. If you want to design your own rings, but don’t feel competent (or have the desire) to make them with your own hands, there are many jewelers that have “put together” options which make one-of-a-kind combinations for you. Mondera offers enduring traditional craftsmanship, unique innovative ideas, and a modern approach to serve your needs. Mondera was founded by Fred and Pascal Mouawad and offers the collective experience of 119 years in the jewelry business. The Mouawad tradition began in 1860, when David Mouawad left Lebanon to learn watch and jewelry making in the US. When he returned to Lebanon, he opened his own shop. His great-grandchildren, Fred and Pascal continue the family business today. The Mondera promise is that their jewelry passes stringent quality control checks. Every diamond is high quality, graded by the Gemological Institute of America (GIA) or the American Gem Society (AGS). The stones come with Diamond Certificates issued by those agencies. Mondera doesn’t compromise on workmanship or quality in their products. They have their own global network which provides the highest quality gems and settings directly from the source. This permits Mondera to give its customers exceptional value in the US, and worldwide. 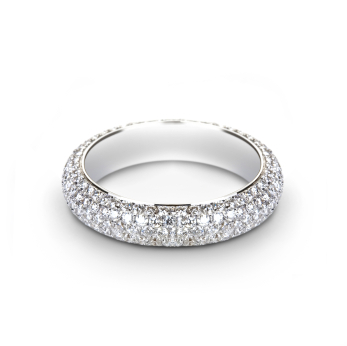 Pricing for bands ranges from $410 to $1760, and diamond/gemstone bands from $770 to $4000 USD. Thousands of customers have expressed satisfaction in dealing with true online jewelry experts. Using Mondera’s Learning Center, you can get a better understanding about diamonds, gemstones, and precious metals. You learn to make an informed decision and then can purchase the combination that will be a special reflection of your love. The jewelry you purchase will be the ideal engagement (or wedding) ring, displaying timeless quality. Mondera is so certain you will be thrilled with your purchase that they provide a 30 day return policy. At the end of that time, if you aren’t satisfied, you may return it for a refund. They want to make a “sparkling” relationship with you for life. Rokstok Custom Jewelry Design provides an extensive selection of diamonds, gemstones, pearls, and metals including platinum. Take some time looking through the loose diamond selection, and then create your own ring, set in gold or platinum. Custom design jewelry has tended to require faith that your idea could be accurately translated into a unique ring. Combining 40 years’ experience with the latest design technology, Rokstok”s team gives life to your inspiration, crafting an exquisite piece of jewelry. The custom, hand-crafted jewelry, they create has no limitations. Design a unique wedding ring for both husband and wife. Rokstok’s team can replicate designs you provide as long as they aren’t copyrighted. Their expert jewelers remain true to your vision every step through the making of your custom rings. Capturing your inspiration and applying precision technology, they create each piece with unsurpassed craftsmanship. With Rokstok’s sophisticated design software they create a precise three dimensional model of the designer piece. These models make strikingly realistic renderings of the rings, permitting you to see the design’s accuracy with the utmost confidence. Diamond ring pricing begins about $1350 and ranges to $4000 USD. Added gemstones will increase the price minimally. Jewelry has dimension and textures that vary with changing perspective. Rokstok’s graphic artists create the 3D model to give you a life-like image that can be seen from all angles. The model provides a realistic image of your ring as it will be when completed. Any changes you desire can be implemented at this stage in order to ensure your satisfaction. This Custom Jewelry Design Process has proven the most effective in encapsulating your vision. Once you approve the rendering of your custom ring, the 3D model is sent to wax growing machines to create the prototype. This provides you with the highest resolution standards possible, producing precision in the final piece. Rokstok provides a Custom Design Warranty because the prototype is so precise. A mold is created from this, and your desired metal is injected into it to make the casting, and your finished ring has begun. The craftsmen take over from there and prepare the casting parts for assembly. Diamonds and/or gemstones are hand-selected for the piece and firmly mounted. The ring is finished to a bright polish and inspected by at least three Rokstok jewelers. You can buy with confidence. Rokstok offers a one year warranty against manufacturing defects, even the loss of the diamonds or gemstones. After you have shared your ideas with Rokstok, they will provide a quote for the creation of the ring you have dreamed of presenting. A unique and elegant engagement ring or fine band for the husband-to-be, can be made to your specifications. Using Rokstok’s Custom Jewelry Design Quote online, providing the details of your request and your contact information, you will receive a reply and your quote within 48 hours. Then your individual, unique engagement or wedding ring can begin its life, to be cherished for years to come. Hi there im looking for custom wedding bands like the hello kitty wedding ring but add some a lil bit of stones and a white gold.. and u think how much it cost me? ?